For nearly two decades, they both worked at Wright State University at the same time, not far from each other. But they never met. Then in a very cosmic way, their paths crossed when Joyce Howes donated one of her kidneys to Phil Combs. Combs’ kidneys, damaged by decades of diabetes, began to fail in early 2016. He was slowly being poisoned by his own body. On Oct. 17, 2016, he went to the emergency room and was told that he had barely escaped going into a coma because there was such a high level of toxins in his blood. He began emergency dialysis. Kidney dialysis is a life-saving treatment that artificially removes waste and toxins from the body by filtering blood through a machine. It is typically done several times a week in sessions that each last several hours. Dialysis is not as efficient as real kidneys and can produce side effects that include weight gain, low blood pressure, muscle cramps and infection. Combs spent several months in hemodialysis until the port inserted in his abdomen healed then switched to peritoneal dialysis. This enabled him to receive the cleaning his blood needed while he slept, though it took nine hours per night. A few days after he returned to work from the hospital in 2016, Combs learned that his job at Wright State’s Center for Teaching and Learning (CTL) had been eliminated due to budget cuts. Combs sent out two mailings to the Wright State community in 2017 trying to find a donor. A few people responded but said they couldn’t be donors. Five friends outside of Wright State volunteered to be donors but turned out not to be matches. 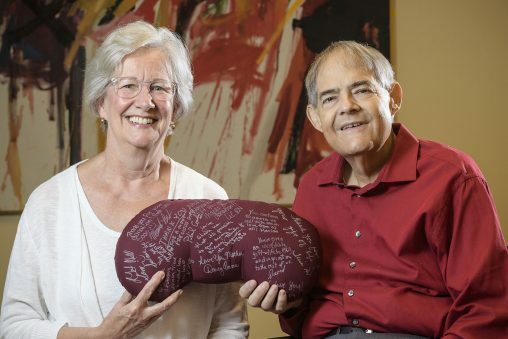 Combs resigned himself to being on a waiting list for a kidney from a deceased donor. But he didn’t know about Joyce Howes. When Howes read Combs’ appeal for a donor and realized he had lost his job, income and benefits, she didn’t hesitate. She immediately picked up the phone and called the University of Cincinnati Health Center to offer herself as a donor candidate. After sending the hospital samples of her blood, she waited … and waited … and waited. Two months went by. Combs also got a call from the center at the same time last January, telling him a person from Wright State by the name of Joyce Howes had volunteered to be a donor and was a match. The two of them met for coffee at Bob Evans. Since the surgery, Joyce Howes and Phil Combs have remained in touch, even having lunch together. Combs grew up in Dayton and graduated from Stebbins High School in 1976. He worked in retail for several years before enrolling at Wright State and in 1986 earned a bachelor’s degree in English. While working as a technical writer for several different government contractors, Combs’ talent for working on computers was recognized and he was pressed into service in maintaining them. He went on to work for three years at ThinkTV , the Dayton PBS member station, before landing a position in 1999 at Wright State, doing computer support for CTL. Howes grew up in Kettering. Her interest in science was inspired at a young age by her father, who was an amateur naturalist and outdoorsman. Spending time hiking, fishing and “creekin’” was a big part of her childhood. After graduating from Fairmont East High School, Howes enrolled at Wright State, but dropped out after a year-and-a-half, returning five years later to study biology. She earned her bachelor’s degree in 1978 and her master’s degree in 1980 and then began work as an instructor in the university’s Department of Biological Sciences. Eight years later she was named assistant to the department chair, then assistant dean of the College of Science and Mathematics, where she remained for 22 years before retiring in 2015. She currently works as an adjunct instructor in biological sciences and is president of the Wright State University Retirees Association. 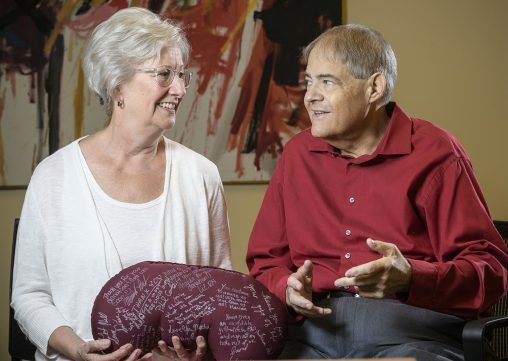 Howes, 67, underwent an immense battery of medical tests at the Cincinnati hospital in preparation for the transplant, in part to make sure she was healthy enough for the surgery. On April 30, Howes and Combs found themselves in adjacent operating rooms. Their surgeries were done simultaneously. For Howes, it was one four-inch incision and two tiny laparoscopic incisions. She said the surgeons were extremely skilled and inspired confidence. She spent one night in the hospital and then about two weeks at home recovering. At the end of six weeks, Howes returned to all of her normal activities. Combs estimates his surgery took about five hours. His new kidney began working immediately. He remained in the hospital for four days, stayed with friends who cared for him for two weeks and then went home. Combs still has some swelling in his lower extremities. And he has a giant, hockey-stick-shaped incision that traverses his entire abdomen. Combs said his friends at CTL stood by and supported him during his ordeal. Since the surgery, Howes and Combs have remained in touch, even having lunch together. Howes said the transplant experience has made her an evangelist for people becoming living kidney donors. People interested in becoming a donor candidate can call the University of Cincinnati Kidney Program at 513-584-7001 or the National Kidney Foundation at 513-961-8105 in Cincinnati or 614-882-8184 in Columbus.